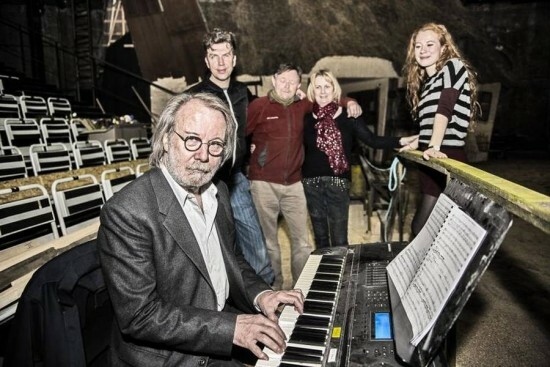 On 12 April 2015, a new Danish production of Benny Andersson’s, Björn Ulvaeus’, Kristina Lugn’s and Lars Rudolfsson’s musical comedy, Hjälp sökes, will premiere in Copenhagen. 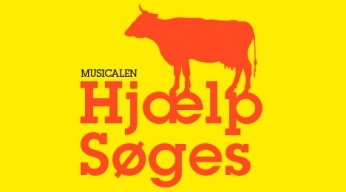 The Hjælp søges production, features a cast of just 4 people who perform alongside 17 animals, including a giant cow, horses, pigs, a goat, dogs and geese. It is being staged at the Østre Gasværk Teater, which has been transformed by 30 tonnes of soil into an authentic looking Danish smallholding. Earlier this week Benny flew to Copenhagen to oversee rehearsals. “It is important to me that I am here,” he told journalists. “This music took almost a year to compose and, as with anything that I create, I always try to ensure that it is presented to the world as well as it possibly can be,” he explained. Benny said that although he usually finds it difficult to relinquish control of his music to other people, this is not the case when working with Björn or Lars in whom he has complete trust. After watching Wednesday’s rehearsals he said that he is more than satisfied that the show will be ready by the opening night. “What I have seen so far, looks and sounds amazing,” Benny said. “Jesper Lohmann and Jesper Asholt (who portray brothers Axel and Engelbrekt) are both wonderful in their roles and Sara Viktoria (Hillevi) has such a beautiful, sweet voice that really suits the music,” he enthused. Lohmann says that he has the greatest respect for Benny, and is thrilled to be part of this production. “There are so many ingredients in this one idea,” he said. “ABBA music, great comedy, trained animals and a fantastic story about rural Denmark. I cannot imagine what more you could add!” he said. “Having Benny at rehearsals was very special and although it felt relaxed, I think without doubt, that we all worked just that little bit harder. It was certainly not an ordinary day at the office!” Lohmann laughed. When first performed at Stockholm’s Orionteatern in February 2013, Hjälp sökes received glowing reviews from the critics. A CD featuring all of the songs together with some incidental music was released in September 2013 and a live recording of the show broadcast on Swedish television in January 2014. Hjælp søges, which has been translated into Danish by singer Anne Linnet and author Pia Tafdrup, will run at the Øster Gasværk Teater from 12 April until 7 June 2015. Tickets to all 48 scheduled performances, including the premiere, are available now on the theatre’s website. Although Benny will be 69 this year, during his trip to Denmark he made it quite clear that he has no plans to retire. “Why would I?” he said. “Not when I have a job that I love. What would I do instead?” he questioned. “Sit at home and read? No! I shall continue to work as long as I can,” Benny told reporters. “I hope I still have some music in me that is not written yet,” he said. “Some good music!” he grinned.